ST. GEORGE – Construction began in mid-December to make way for and build an earthen buttress intended to slow down and possibly even stop a creeping landslide that threatens properties along the 900 South portion of Bluff Street. “We hope it will work as a more permanent fit,” said Dan Steurer, a member of the Gardens South Condominium Homeowners Association and owner of the Airport Hill Landslide blog. The blog provides background information on the landslide and updates on the progress made by the HOA in addressing the matter. The Gardens South Condominiums sit on a portion of the Black Hill in St. George just above the businesses of Dairy Queen, The Claim-Jumper Steakhouse and Knights Inn and Suites. These properties are also threatened by the landslide according to a geotechnical study conducted by Applied Geological Engineering Consultants. A dramatic example of the threat the slide poses became visibly apparent when Building L of the Garden South split in half along its fire wall due to a shifting foundation in early July 2011. Prior to the building split, residents were forced to evacuate Building L due to slide-triggered breaks in utility and water lines at the Knights Inn and Gardens South. Residents were also forced to evacuate Gardens South Building M due to slide-related fears. 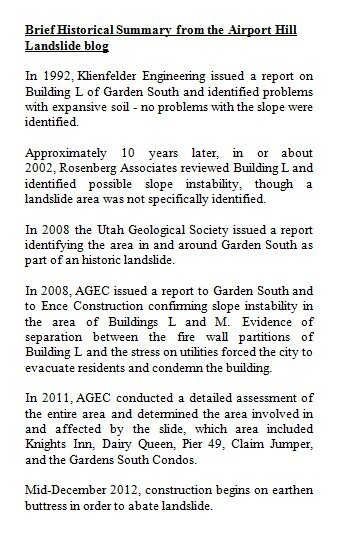 The City of St. George has condemned both buildings. 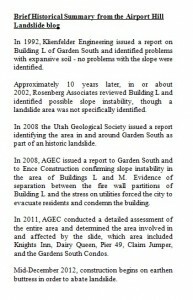 According to a summary of a presentation given to the HOA by Jim Nordquist of AGEC in June 2011, the current landslide is actually a part of an ancient landslide that’s been creeping down the hillside for a very, very long time. The rate of movement for the slide has been slow over the last 20 years – one inch per year. However, within a year’s time, the slide has picked up speed, moving as much as five inches during a six month period, and one inch in less than a week. “The enemy is water,” Steurer said. When the Gardens South and properties below it were built, Steurer said, it wasn’t known at the time that the earth was weak beneath the foundations and was prone to shift after being heavily saturated. Because of this an adequate drainage system was not constructed. So when the rain falls and sinks into the hill, “the hill moves with it,” Steurer said. The lack of a proper drainage system also “continually compounds the problems,” he said. Another part of the problem is that the toe of the hill – the bottom of the slide – was originally cut away when the properties at the base of the hill were built. Now the remaining slide is shifting forward to make up the difference. Though it has nearly taken two years and Gardens South’s shouldering much of the costs up to this point, the HOA, Knights Inn and Dairy Queen properties have agreed to pool their resources and share the cost of the buttress’s construction. The City of St. George is also involved in the process, albeit somewhat indirectly. “The city’s been very helpful to us,” Steurer said. Mortensen said the city provided a loan of between $50,000 to $70,000 to the group to help cover some of the construction cost which is estimated to be around $500,000. 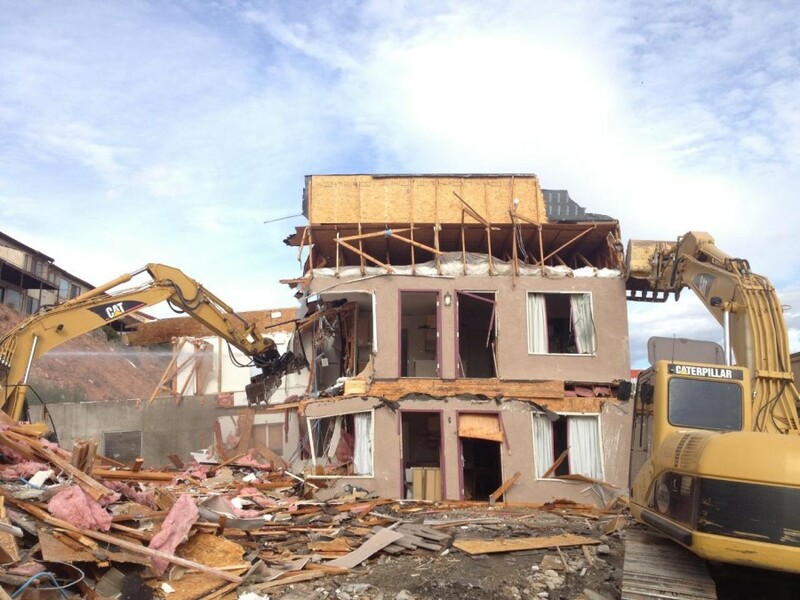 In order to stay involved in the process, the city will be receiving weekly reports on the buttress’s construction and eventual success or failure. “We’re optimistic (the buttress) will slow the hill down,” Steurer said. Though considered a temporary solution, Steurer said it’s hoped the buttress will prove more of a permanent fix, as it is the best fix for the price at this time. Other methods of landslide abatement can run between $3 million and $6 million, he said. “The question is: at what point do you stop pouring money into a bad situation?” Steurer said. If the buttress fails, Buildings M and L may have to be torn down, he said. 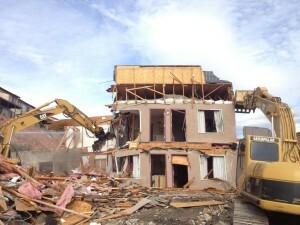 A half of Building L has already been demolished, and a condemned section of Knights Inn behind The Claim-Jumper Steakhouse has also been torn down, though the latter was done to make way for a section of the buttress. In the long run, a continued landslide will not only threaten the properties currently involved in trying to stop it, but will grow to affect those around them as well, Swensen said. Should the buttress prove successful, it may be possible to repair damaged buildings and allow displaced residents to return their homes at some point in the future. Oh, for the good old days when anything goes in the building frenzy. Gotta be tough to make a buck now. Wow, seeing as how those buildings were built well before any “Building frenzy”, and before geological testing was available. It seams a tad bit stretching to tie this to the building boom. Shame on the owners of the Claim Jumper who seem to be nothing but a bunch of dregs in the whole process. Refusing to help with costs while businesses around them do so, and then not allowing a portion of access through their crappy parking lot? Uh, okay. I won’t be eating there, or sending any of my guests there anytime soon. I agree with your assessment of the Claim-Jumper. My husband and I went there not long ago and it was easily the most disappointing restaurant experience we’ve had in St. George. I feel sorry for the owners of the residential properties that are in danger.